John also is an Adjunct Associate Professor of Wildlife Conservation at the University of Massachusetts, Amherst, Michigan State University, and Andres Bello University in Santiago, Chile. He is a certified Wildlife Biologist and Past President and Fellow of The Wildlife Society. He is also a Professional Member of the Boone and Crockett Club and a Senior Specialist in the Fulbright Scholar Program. He is a member of the IUCN Otter Specialist and Sustainable Use and Livelihoods Groups, and an instructor and Advisory Board member of the Conservation Leaders for Tomorrow Program. He is also a consultant to the Peru Forest Sector Initiative where he is assisting the Peruvian government in training biologists and developing wildlife regulations. He advises M.S. and Ph.D. students studying carnivores and human dimensions in Africa, Canada, Chile, and the U.S. and teaches graduate courses in Wildlife Management and Conservation and Human Dimensions of Wildlife Conservation. Only John's five most recent publications are shown here. 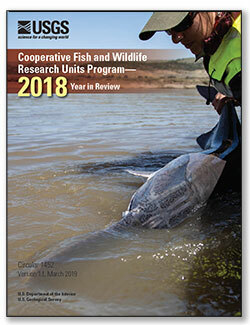 For more information about John, including a full publications list, visit his profile page on the Cooperative Research Units Program Headquarters web site. Organ, John F.; Thompson, John D.; Childs, Dawn E.; Dennerline, Donald E.
Organ, John F.; Thompson, John D.; Childs, Dawn; Dennerline, Donald E.
Mawdsley, Jonathan R.; Organ, John F.; Decker, Daniel J.; Forstchen, Ann; Regan, Ronald J.; Riley, Shawn J.; Boyce, Mark S.; Mcdonald, John E.; Dwyer, Chris; Mahoney, Shane P.
J. R. Mawdsley, J. F. Organ, D. J. Decker, A. B. Forstchen, R. J. Regan, S. J. Riley, M. S. Boyce, J. E. McDonald Jr., C. Dwyer, S. P. Mahoney, Artelle et al. 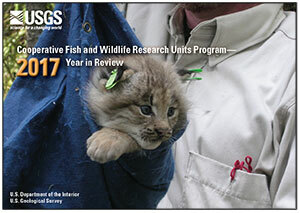 (2018) miss the science underlying North American wildlife management. Sci. Adv. 4, eaat8281 (2018). Wildlife management is science based: Myth or reality? In the January/February issue of ﻿The Wildlife Professional﻿, a group of wildlife leaders discussed what they considered "myths" in wildlife management and invited other wildlife professionals to contribute their favorites. Here, five wildlife professionals take up that theme with their discussions of the scientific basis of wildlife management. Decker, Daniel J.; Organ, John F.; Forstchen, Ann; Schiavone, Michael V.; Fuller, Angela K.
Rayl, N.D., Bastille-Rousseau, G., Organ, J.F., Mumma, M.A., Mahoney, S.P., Soulliere, C.E., Lewis, K.P., Otto, R.D., Murray, D.L., Waits, L.P., & Fuller, T.K. (2018) Data from: Spatiotemporal heterogeneity in prey abundance and vulnerability shapes the foraging tactics of an omnivore. Journal of Animal Ecology. Organ, J.F. 2018. History of state wildlife management in the United States. Chapter 1, pages 1 - 23 in T.J. Ryder, editor, State wildlife management and conservation. Johns Hopkins University Press, Baltimore, Maryland, USA. 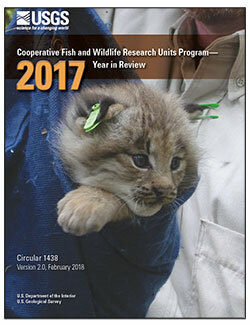 Organ, John F.; Thompson, John D.; Dennerline, Donald E.; Childs, Dawn E.
Organ, J.F., Thompson, J.D., Dennerline, D.E., and Childs, D.E., 2018, Cooperative Fish and Wildlife Research Units Program—2017 year in review (ver. 2.0, February 28, 2018): U.S. Geological Survey Circular 1438, 68 p., https://doi.org/10.3133/cir1438. 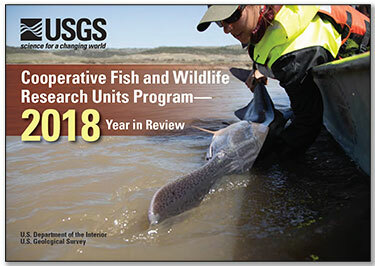 Organ, John F.; Thompson, John D.; Dennerline, Donald E. ; Childs, Dawn E.
Organ, J.F., Thompson, J.D., Dennerline, D.E., and Childs, D.E., 2018, Cooperative Fish and Wildlife Research Units Program—2017 year in review postcard: U.S. Geological Survey General Information Product 184, 2 p., https://doi.org/10.3133/gip184. Goguen, Amber D.; Riley, Shawn J.; Organ, John F.; Rudolph, Brent A.
Wildlife governance in the 21st century—Will sustainable use endure? Decker, Daniel J.; Organ, John F.; Forstchen, Ann; Jacobson, Cynthia A.; Siemer, William F.; Smith, Christian A.; Lederle, Patrick E.; Schiavone, Michael V.
Organ, John F.; Mumma, Matthew; Holbrook, Joseph D.; Rayl, Nathaniel D.; Zieminski, Christopher J.; Fuller, Todd K.; Mahoney, Shane P.; Waits, Lisette P.
Mumma, M.A., J.D. Holbrook, N.D. Rayl, C.J. Zieminski, T.K. Fuller, J.F. Organ, S.P. Mahoney, and L.P. Waits. 2017. Examining spatial patterns of selection and use for an altered predator guild. Oecologia DOI 10.1007/s00442-017-3971-8. Published online: 16 October 2017. The growth of sport shooting participation: What does this trend mean for conservation revenue? Duda, Mark D.; Beppler, Tom; Organ, John F.
North American model and captive cervid facilities-what is the threat? Organ, J.F. The North American model of wildlife conservation and wild turkey management: the future. Pages 19-23 in D.E. Miller, editor, Proceedings of the eleventh national wild turkey symposium. Allen Press, Lawrence, Kansas, USA. Rayl, N.D., T.K. Fuller, J.F. Organ, J.E. McDonald, Jr., R.D. Otto, G. Bastille-Rousseau, C.E. Soulliere and S.P. Mahoney. 2015. Spatiotemporal variation in the distribution of potential predators of a resource pulse: black bears and caribou calves in Newfoundland. Journal of Wildlife Management 79(7): 1041-1050. Stakeholder engagement in wildlife management: does the public trust doctrine imply limits? Decker, D.J., A.B. Forstchen, E.F. Pomeranz, C.A. Smith, S.J. Riley, C.A. Jacobson, J.F. Organ, and G.R. Batcheller. 2015. Stakeholder engagement in wildlife management: does the public trust doctrine imply limits? J. Wildl. Manage. 79:174-179.